PHILADELPHIA (JTA) — After Tim Kaine, Biden, Bloomberg, Bernie, Bill, and both Obamas, it’s finally Hillary’s turn. Hillary Clinton, the Democratic presidential nominee, will close out a Democratic National Convention centered on highlighting America’s diversity, touting her qualifications and bashing her Republican opponent, Donald Trump. Clinton’s address will be historic: She is the first woman presidential nominee of a major political party. Stylistically, Clinton is Trump’s opposite. Where he is bombastic, she is restrained. Where he extemporizes, she stays on script. Where he makes broad promises, she talks specific policy. But like the Donald, Hillary has Jewish connections, from her family to her political allies. Here are five Jewish things to expect from the Democratic nominee. She will talk about children and mention her Jewish grandkids. If there’s one constant trope in this election, it’s that Hillary Clinton fights for children. Saying that she worked at the Children’s Defense Fund out of law school has become the Democratic version of mentioning Ronald Reagan at the Republican convention. First Lady Michelle Obama made her entire speech about Clinton being good for kids. Speakers have touted her legislation for children’s health insurance. Expect Clinton to emphasize this issue. Like previous speakers, she will paint herself as the candidate for our children, an image that at once aims to humanize her and show her policy experience. And she will throw in a shout-out to her favorite kids — grandchildren Charlotte and Aiden Clinton Mezvinsky — whose father, Marc Mezvinsky, is Jewish. This convention, in fact Clinton’s entire campaign, has not shied away from talking about shattering a glass ceiling. 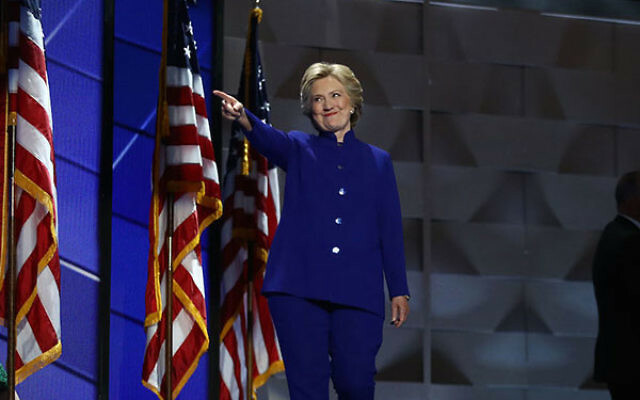 Nearly every speaker has noted Clinton being the first woman to be the presidential nominee of a major party, and many have told the crowd that electing the first woman president is a good reason to vote for her. Expect Clinton to own this. Women’s issues — from equal pay to paid family leave — are a centerpiece of her campaign, and she sees herself as a symbol of that fight. And just as her campaign is historic, she has placed herself in history. Expect her to do that here by mentioning some of the pioneering women who came before her. She might even mention some of the Jewish trailblazers of recent decades — from Gloria Steinem to Barbara Boxer or Madeleine Albright (and could earn easy points with Jewish voters by tossing in Bella Abzug or Golda Meir). She will throw red meat to Bernie Sanders supporters. In the race for the nomination, Clinton bested the first Jewish candidate to win a major party primary. But Bernie Sanders’ left-wing delegates have not gone quietly, lambasting Clinton at news conferences and in protests for what they see as her hawkish foreign policy, previous support for free trade deals and ties to Wall Street. To placate the Sanders wing of the party, Clinton yielded to some of his demands in the Democratic platform and has endorsed some of his issues. Earlier in the convention, some speakers — including President Barack Obama — talked about “feeling the Bern.” Expect her to include some lines about central Sanders policies like raising the minimum wage or making college more affordable in an effort to woo his voters come November. She will back the Iran deal. One of Clinton’s most controversial stances among Jewish organizations — and the Israeli government — is her support for the agreement to curb Iran’s nuclear program. While the Israeli government has lambasted the deal as a gift of billions of dollars to a sponsor of terror against Israel, Democrats defend it as the best way to keep Iran from acquiring the bomb. Expect Clinton to echo this defense. She has taken a more cautious posture on the issue than some other Democrats, but intends to stand by the agreement once in office. Attempting to placate pro-Israel skeptics, she has promised to hold Iran accountable for potential violations. And she has made overtures to the pro-Israel crowd in other ways, pledging to meet with Prime Minister Benjamin Netanyahu soon after taking office and ensuring the Democratic platform remained unequivocally pro-Israel. She will defend religious freedom. Trump’s critics have accused him of impinging on religious freedom — like his proposed ban on Muslim immigration — and eroding the separation of church and state, like his pledge to allow houses of worship to endorse political candidates. Praising American religious and ethnic inclusiveness has been a theme of the convention and one Clinton will likely talk up. Whether calling American diversity a source of its strength or impugning Trump as a bigot, expect her speech to emphasize religious tolerance.